Manufacturers of plasticizers made with polychlorinated biphenyls (PCBs) could not be held liable for contamination arising from the use of their plasticizers in caulk used in a school building constructed in 1970, a Massachusetts federal district court held in a decision granting the manufacturers’ motion for summary judgment. In reaching this conclusion, the court determined that the plaintiff failed to present evidence establishing valid claims of breach of implied warranty of merchantability under theories of design defect or failure to warn, or negligence (Town of Westport v. Monsanto Co., April 7, 2017, Casper, D.). The Town of Westport, Massachusetts, filed suit against Monsanto Company and other related entities, alleging that one of its school buildings, Westport Middle School, was contaminated with PCBs from plasticizers produced by the defendants and used in caulk formulations provided to the builder of the school from a third party. While the school was built in 1970, the alleged contamination was discovered in 2010 when the school was having windows replaced as part of a Green Repair Program. As preparation for the work, the school was tested for contaminates, which identified PCBs in the window glazing, exterior window caulking, and interior door caulking. As a result of this discovery, the town began a multimillion dollar PCB remediation project to remove all materials containing PCBs from the school. The defendants moved for summary judgment on the town’s claims of breach of the implied warranty of merchantability for defective design and failure to warn, and negligence. Additionally, the defendants sought to exclude the reports and anticipated testimony of a number of the plaintiff’s proposed experts. Breach of implied warranties of merchantability. The court granted summary judgment to the manufacturers of the PCBs with respect to the town’s claims for breach of implied warranties. Under Massachusetts law, manufacturers impliedly warrant that their products will be "fit for the ordinary purposes for which such goods are used." To succeed on a breach of implied warranty of merchantability claim, the town must show that: (1) the defendants manufactured or sold the product that caused the injury or damage; (2) a defect or unreasonably dangerous condition existed so that it was not suitable for the ordinary uses for which goods of that kind were sold; (3) the product was used in a manner that the manufacturers intended or that could reasonably have been foreseen; and (4) the defect or unreasonably defective condition was a legal cause of the town’s injury. A plaintiff can base a claim for breach of an implied warranty on a manufacturing, design, or warning defect that made the product unreasonably dangerous. Design defect. The manufacturers argued that the town could not prevail on a design defect theory because the town failed to show that a technologically feasible and practical alternative design existed at the time the school was built. Citing the examples of lead paint, the court stated that the case law supported the proposition that an inherent danger in a product does not conclusively determine the existence of a design defect because a defective condition cannot arise from an inherent characteristic of a product. The town’s attempt to premise its argument on the design of the plasticizers, not on the PCBs, was unavailing because the plasticizers at issue were complex mixtures containing multiple PCB isomers. The town’s claim that the manufacturers could have made a different plasticizer without the use of PCBs was not evidence of an alternative design but, rather, a complete replacement of one item for another. Based on the evidence presented, the court agreed with the manufacturers, finding that the town failed to demonstrate that a feasible alternative design existed. Notwithstanding this determination, the court went on to explain that even if an alternative design existed, the town’s claim would still fail because the town failed to produce evidence to support a finding that the specific risk of harm associated with PCBs in caulk was reasonably foreseeable or discoverable by the manufacturers in 1969. Thus, the court determined that summary judgment in favor of the manufacturers was warranted. Failure to warn. Similarly, the court granted summary judgment to the manufacturers on the town’s breach of warranty claim based on failure to warn. The town asserted that the manufacturers failed to: (1) provide adequate warnings to end users at the time of sale; and (2) provide adequate warnings post-sale under their continuing duty to warn. Because both of these theories require that the risk of harm be reasonably foreseeable, and because the court previously determined that the risk was not reasonably foreseeable at the time of sale, the court again concluded that summary judgment in favor of the manufacturers was warranted. Negligence. Finally, the court also granted summary judgment for the manufacturers on the town’s negligence claims. In order to establish a valid claim, the town was required to show that the manufacturers had breached a legally cognizable duty of care. Under a design defect claim, that duty of care requires manufacturers to design products to eliminate foreseeable defects or dangers to consumers. However, because the court has already determined that the alleged harm caused by the PCBs in the manufacturers’ plasticizers was not reasonably foreseeable and that a plausible alternative design did not exist, the town’s negligence claims were unsupported by evidence. 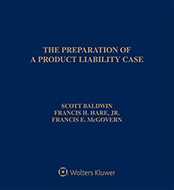 For the same reasons as explained for the design and warning defect claims under the breach of implied warranty theory, the manufacturers’ motion for summary judgment was granted. The case is No. 14-12041. Attorneys: Alicia D. Butler (Baron & Budd, PC) for Town of Westport. Adam E. Miller (Capes, Sokol, Goodman & Sarachan, PC) for Monsanto Co., Solutia, Inc., and Pharmacia Corp.
Companies: Town of Westport; Monsanto Co.; Solutia, Inc.; Pharmacia Corp.